Stir lime juice, olive oil, cumin, chipotle chile powder, salt, pepper, garlic and agave or maple syrup together in a large bowl. Add bell pepper, zucchini, onion and jalapeño. Toss to coat. Optionally, allow to marinade at room temperature for up to an hour. Place a large skillet over medium-high heat. Once hot, add veggies and cook, flipping frequently, until most of the liquid has cooked off and veggies are tender-crisp, about 4 minutes. Remove from heat and add beans and cilantro. Flip a few times to incorporate, then transfer the mixture to a plate. In small bowl, lightly mash the avocados with a fork. Spread a quarter or a sixth of mashed avocado onto half of a tortilla. Sprinkle with salt and pepper, and optionally with some hot sauce. 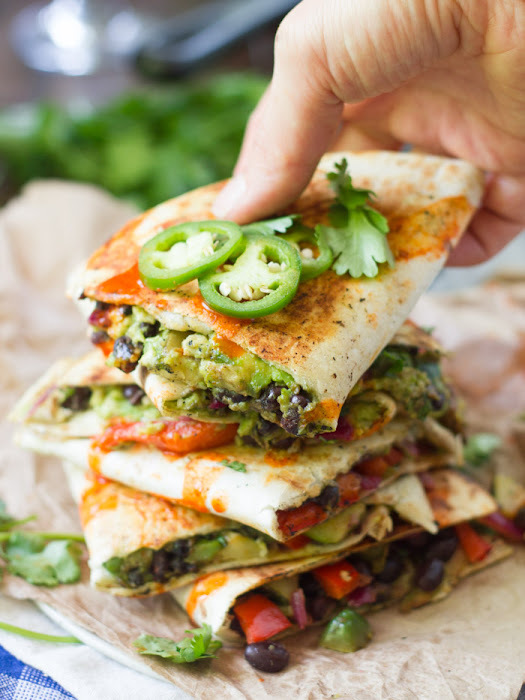 Arrange an even layer of veggies over avocado, then fold the tortilla closed over the veggies. Repeat until all tortillas are filled and all fillings are used. Lightly oil the skillet and place over medium heat. Place one or two tortillas onto skillet and grill until browned and crispy on bottom, about 4 minutes. Flip and grill until browned on opposite side, about 4 minutes more. Repeat until all quesadillas are cooked, adding oil to the skillet as needed.